The Johns Hopkins Berman Institute of Bioethics wrote a blog post about our recent work on Conducting Research in Commercially-Owned Online Space. 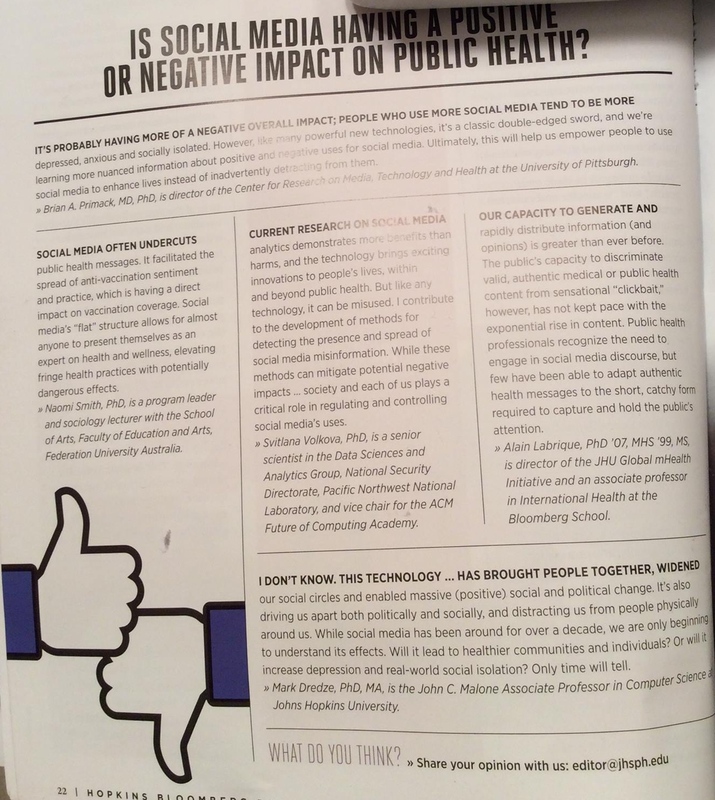 Is Social Media Having a Positive or Negative Impact on Public Health? The Bloomberg Public Health Magazine asked, I answered. My work was featured in the Johns Hopkins Engineering Magazine: Modern Day Miners. Talk at the UMD CLIP Lab. My colleagues (120+!) and I authored a letter to promote welcoming environments for women at machine learning conferences. Our paper on online sales of marijuana was covered by NBC, US News & World Report, Inquisitr, Futurism, Civilized, Fresh and Inverse. Check out video coverage by NBC affiliate WCNC in Charlotte, NC. I was named the John C Malone Associate Professor of Computer Science. I was featured in Baltimore Style for my work on gun violence. Our paper about a selfie promoting public engagement with skin cancer was covered by the Daily Mail, Sun, Independent, Mirror, Allure, LADbible, Cosmopolitan, Hollywood Life,Yahoo!, Refinery 29, Buzz, International Business Times, IB Times UK, Women's Health,MSN, US News & World Report, Unilad, Honey, Global News, Fox News, Live Science. Michael Paul and I wrote a book! Social Monitoring for Public Health. Preprint available for free. Press Release. Our paper about heat-not-burn tobacco products was covered by Daily Mail, Discover Magazine, Global News, US News, Medpage Today, The Sun, The San Diego Union-Tribune and Web MD. Our paper about increased interest in suicide following Thirteen Reasons Why was featured on the Johns Hopkins Hub. Tech at Bloomberg article about our work on sales of in-home HIV Tests. TMZ covered our paper about the Sheen Effect on Rapid In-home HIV Tests by interviewing Charlie Sheen at a gas station. Our paper about the Sheen Effect on Rapid In-home HIV Tests was covered by CNN, Global News, New York Magazine, Daily Mail, ABC News, Newsweek, US News & World Report, and Der Spiegel. Our paper about reasons for e-cig use was covered by Live Science, InVerse, Men's Fitness, Vice, Medical Express, Mental Daily, iTech. Our paper about youth violence was referenced in a 20/20 episode last year. We won best paper for our paper on Name Variation in Community Question Answering Systems at 2016 The 2nd Workshop on Noisy User-generated Text (W-NUT). Talk at the Bloomberg Data for Good Exchange. Talk at Harvard Computer Science Colloquium Series. Coverage of our JAMA IM article on Pokemon and distracted driving became a trending topic on Facebook. Our JAMA IM article on Pokemon and distracted driving was covered by multiple news outlets:Mirror, Mashable, The Wrap, IBT, ABC, NBC, BBC, NPR, CNN, LA Times, NY Mag, Forbes, Fortune, DailyMail, Mirror, The Wrap, Le Figaro, Le Journal de Montreal, Yahoo News, Bustle, US News, Parent Herald, Dagens Medisin, Dagens Nyheter, MSN, MexicalExpress, Science News, Live Science, Health Day, Medical News Today, Touch Arcade, Kotaku, VG247, UpRoxx, Boston Herald, San Diego Union-Tribune, Mashable,Reuters,Fox News,Vice,Bustle,Gamerant. Article about our work on Gun Violence. Talk at Data Science for Social Good. Our work on Leonardo DiCaprio and climate change was covered in the Washington Post, Forbes, Time, and New York Magazine. Talk at the Bloomberg Quant seminar series. Talk at ICML Workshop on Data4Good presenting our paper on deriving global mobility patterns from Twitter. I was interviewed by On the Media about our paper on the Zika virus. Coverage (Medical Daily, Vocativ, MediaPost, Baltimore Sun, Undark) of our study on the Zika virus pseudoscience on social media. Coverage of our study on the Disneyland measles outbreak. Talk at NYU Text as Data seminar series. Talk on "How News and Social Media Inform Finance" at the Bloomberg and Columbia Workshop on Machine Learning in Finance. Our study on the impact of the Great American Smokeout was covered by CBS News, Science of Us, Lifezette, and US News and World Report. Bloomberg LP discussed our "Sheen effect" article. Charlie Sheen tweeted a link to our study on the "Sheen Effect". Dr. Oz wrote an article as well. Coverage of our JAMA IM paper on the "Sheen Effect" in the many news outlets: CNN, ABC (Video), NBC (Video), LA Times, Newsweek, Vox, US Magazine, WebMD, NY Mag, BBC, CBS News, Huffington Post. Coverage of our paper in the American Journal of Preventive Medicine on electronic cigarette use in Medical Daily, and other outlets. Coverage of our paper in American Psychologist on youth violence in the media: Science Codex. Media coverage of our work on forecasting the flu using multiple data sources. Talk at Text as Data. Our work on Reddit and suicide in the news. I'm quoted in a Washington Post story on social media and health. Talk at the National Center for Immunization and Respiratory Diseases (NCIRD), Centers for Disease Control and Prevention. Our work on social media and health, including coverage of multiple articles, was published on BuzzFeed. Our work on Twitter and vaccines was published on The Conversation. Talk at the NIH NIMHD Workshop on Science of Prevention and Health Promotion to Address Health Disparities. Our work on Twitter and vaccines is covered by NY Mag, Business Standard, MedicalXpress, EurekAlert, Healio, and Lab Manager. Two talks at Columbia University. Talk at Microsoft Research NYC. I wrote an article entitled "Mining 21st Century Chatter?" for the Johns Hopkins Engineering Magazine. Our paper "What Are Health-Related Users Tweeting?" was in the top 10 most tweeted articles in JMIR for 2014. Our work on Twitter and mental health is covered by the New York Times. Our work on Twitter and mental health is covered by GigaOM and The Washington Post. Our work on the flu featured on the NBC Nightly News [video]. Talks at the Centers for Disease Control and Prevention on tobacco control and public health surveillance. Talk at the American Cancer Society. The Partially Derivative podcast covered our mental health work. Our work on the flu in Fast Company. I'm quoted in an article about hospital community engagement (Hospitals & Health Networks.). Our work on flu in Healthcare Global. Our work on mental health is covered in Newsweek. I helped organize the Computational Linguistics and Clinical Psychology Hackathon. Our work on flu forecasting is covered by Slate. I'm quoted in a POLITICO article on Ebola response. Our work on mental health is mentioned by Fortune. Talk at the Influenza Prediction Workshop at the Centers for Disease Control and Prevention. Out work on mental health is covered by The Boston Globe. We hosted NACLO at JHU as the largest site in North America. I had a small role in contributing to the report on The Use of Social Media to Prevent Behavioral Risk Factors Associated with Chronic Disease by the eHealth Initiative. My co-author John Ayers gave a TedX talk on our work. My work on public health effects of the great recession is featured in Huffington Post, New York Times Blogs, Daily Mail and the JHU HUB. I was on WTOP radio on the National Academy of Engineering segment talking about our work on tracking the flu with Twitter. I will be on a panel at the Mid-Atlantic Student Colloquium on Speech, Language and Learning (MASC-SLL). Talk at Digital Surveillance Workshop at the Centers for Disease Control and Prevention. My work on mining drug forums was featured in the Johns Hopkins Engineering Magazine. Talk at Workshop on Digital Epidemiology at the ISI Foundation. CPHIT and my work were featured in the Johns Hopkins Public Health Magazine. Talk for the National Association of County and City Health Officials. Talk at Columbia in the IGERT From Data to Solutions seminar. Talk at the New York City Department of Health and Mental Hygiene. I spoke at the Big Data in Public Health conference. Our work was featured in the Washington Post. I spoke at the Social Media And Response Management Interface Event (SMARMIE). My talk and subsequent panel are online (starts at 3:39.) I am also in the final panel. David Broniatowski, my colleague in CAM in Emergency Medicine, was on Sound Medicine talking about our work. Midday with Dan Rodricks. My segment starts around 25:00. I was on the WYPR health minute [Here] and [Here]. I co-authored the report Understanding and preventing youth violence as part of the Subcommittee on Youth Violence of the Advisory Committee to the Social, Behavioral and Economic Sciences Directorate, National Science Foundation. Our work is covered in a Nature News article. Talk at Columbia in the Biomedical Informatics Department. Our work on tracking influenza with Twitter received a lot of press, including CNN, MarketWatch TV and Michigan Radio. 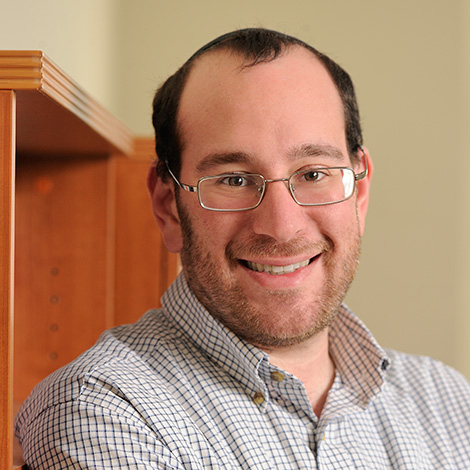 My student Michael Paul has been awarded a Microsoft Research PhD Fellowship. Talk at Emory in the Institute for Quantitative Theory and Methods (QuanTM) Seminar Series. Talk at Georgia Tech in the Robotics and Intelligent Machines Center (RIM) Seminar Series. I will be the NAACL 2013 area chair for machine learning with Phil Blunsom. I am helping to organize the second annual Mid-Atlantic Student Colloquium on Speech, Language and Learning (MASC 2012). I attended the CCC Computing and Healthcare Symposium. Talk at the University of Pennsylvania. Talk at the University of Delaware. I am co-organizing a AAAI 2012 Fall Symposium on Information Retrieval and Knowledge Discovery in Biomedical Text. Talk at the Applied Physics Lab. Work featured on Twitter Stories. Excellent Video. I am a panelist at SXSW. Notes from an audience member. Talk at University of Texas- Dallas. I am a panelist at the Conference of Digital Disease Detection. A video of my talk is available online. Talk at the NIH Opportunities in Data Visualization and Visual Analytics for Behavioral and Social Sciences Research. Talk at JHU's BioStats Seminar. Talk at Carnegie Mellon University. Talk at Mass General Center for Experimental Drugs and Diagnostics. We are hosting 140 people at the first Mid-Atlantic Student Colloquium on Speech, Language and Learning. My student Ariya Rastrow was awarded the inaugural Frederick Jelinek Fellowship. A feature on our Twitter+Health work in The Johns Hopkins Magazine. I will be the ACL 2012 area chair for machine learning with Trevor Cohn. I was on NPR. What fun! Midday with Dan Rodricks [Audio]. Also, see the WYPR health minute [Here] and [Here]. Our health mining research received some press coverage: great articles by The Atlantic and NPR; also see CBS News, Wall Street Journal (blog), Huffington Post, BBC, GigaOM. We've also been on TV! WJLA and PressHereTV. Congratulations to Carolina Parada, who successfully defended her thesis! She is off to Google Research. Giving a talk at the Applied Physics Lab on entity disambiguation. We served as one of the largest NACLO host sites. I am teaching a new seminar on Machine Learning. I organized a workshop on Amazon Mechanical Turk at NAACL 2010. All of the data is available: Check it out. We received some press coverage on the workshop. My student Carolina Parada was awarded the 2010 Google Graduate Fellowship in Speech.